A couple of days ago I entered the Crafty Cardmakers Challenge and I didn't read the challenge instructions or I didn't retain them and I entered the wrong interpretation of the challenge. I looked again and there is still time to enter, so I'm going to give it another shot and add a couple of challenges. 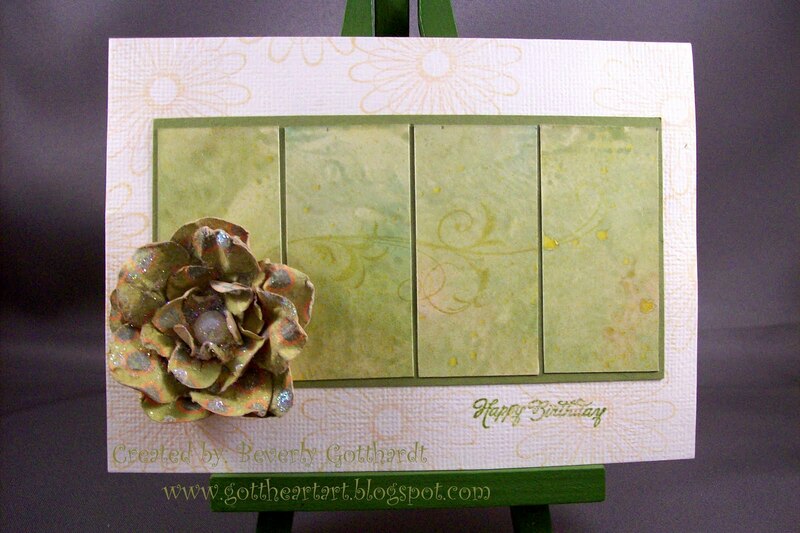 The challenge at Crafty Cardmakers is to use Alcohol Inks. The 4 panels on my card are alcohol inks on glossy card stock. The problem is I didn't write down what colors I used and this was a third pressing of glossy card together, using alcohol blending solution in between, each time the inks got lighter, then I know I sprayed the piece with Stampin Up-gold smooch spray. I'm going to have to start making my list of colors before I get busy squirting them on the non-stick craft sheet and swirling, smooshing and mashing, trying to get something I'm happy with. Each time you do this technique no matter what colors you use it always comes out different, so you just kind of have to pick what colors you like and get inky. I also need to tell you about the flower on my card. When I went to The Funkie Junkie's site to make sure I had the right link for my previous post, her most recent card caught my eye and I just had to click on the link that showed how she made her gorgeous flower. I must give Creations With Christina lots of kudos here. She made 2 great videos so if you are interested please click on her name and after you watch her videos there's no reason you can't make some beautiful flowers of your own. I used a scrap of patterned paper because it had the same colors as my alcohol background and inked it up with some Old Paper and Antique Linen distress ink, used a flat back pearl from Stampin Up Pretties Kit, glossy accents and Stampin Up Dazzling Diamonds glitter because I already had all this stuff in my studio. I was very pleased with my effort. Supplies: Cream Card Blank 4" X 5 1/2" American Crafts, Papers: Stampin Up-Old Olive, glossy card stock, Fancy Pants Designs-Truthful, Stamps: Stampin Up-Punched Posies, CTMH-C1257 Happy Birthday, Autumn Leaves-Flourishes by: Rhonna Farrer, Ink: Stampin Up-Old Olive, Brilliance-Galaxy Gold, Ranger Distress Ink-Antique Linen, Old Paper, Stampin Up-Smoch Spritz gold Glow, Ranger Super Fine embossing powder, Stampin Up-Dazzling Diamonds Glitter, Stampin Up Sizzlits Floral Fusion, Stampin Up-Lg. Fancy Flower Punch, Stampin Up Pretties Kit-flat back pearl, Tombow Multi-Purpose glue, Ranger Glossy Accents, glue dots. Wow, I love the way your alcohol ink panels came out. They are so airy and delicate looking - so pretty! And your flower is perfect. Isn't that a great technique? I couldn't believe how easy it was - could put Prima out of business - LOL!! That's a beautiful card and the muted colours look fab. Thanks so much for joining us at Crafty Cardmakers. Awesome card, so pretty! I love your flower and the alcohol ink panels look fabulous. Thanks so much for playing along with my sketch challenge this week.